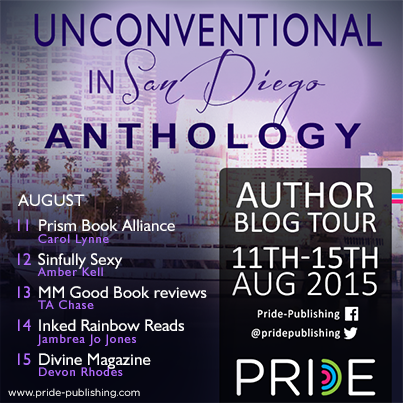 Pride Publishing talks to the authors featured in the Gay Rom Lit anthology this year, Unconventional in San Diego. What is it that you enjoy about writing paranormal characters? Jambrea: The thing I love most about paranormal characters is the fact that you can make stuff up. Anything goes as long as you can explain it in a way that people will believe. The world is yours to make-up. An author can let their mind wander to all different things. Be it a new world, a new shifter or just a tiny bit of magic to make it paranormal. The fun part is mixing it all together. Carol: Anything goes when I write paranormal characters. I can let my imagination fly because my idea of a vampire doesn’t have to fit with what society has deemed them to be. It’s especially fun when I get to work on a project like this where we are given a common theme or place and have to come up with an idea for a story. It’s kind of like working on a jigsaw puzzle for me. I love it! Why did you choose to write your story about such specific paranormal character types? Amber: I always enjoy mixing up paranormals. I had actually envisioned this story a while ago and when I was told of the bar theme I couldn’t resist writing it for this anthology. I chose lions because they are amazing creatures and I liked the idea of lions having to share a mate. In this story they share a fae prince who’s rebelling against his oppressive mother. I also wanted to choose paranormal characters that were different than the others in the anthology. If we all had stories with vampires, or the same type of shifters, who all met at the same bar it wouldn’t necessarily make for interesting reading. TA: When I found out this year’s anthology was going to be about paranormal characters, I was thrilled. I’d been toying with the idea of a unicorn shifter story for a while now, and this gave me a chance to write it. I loved using the old legend of the virgin luring the unicorn to its doom, though I wanted to give it my own little twist. What can we expect from your addition to Unconventional in San Diego? TA: You can expect love and intrigue. Family discord and a little bit of suspense. Also…a love made of legends. Lol I guess you can expect a little bit of everything in this story and I hope you like it. Carol: Fate’s Bridge is a story about finding love again after losing a partner. I chose to write about vampires because I love them so much. I wondered what it would be like for an uptight vampire to fall for a newly-turned surfer. And, just to spice things up, I decided to add yet another vampire into the situation who is a great mix of the other two men. Devon: San Diego is a really great place that I’ve spent quite a bit of time in, so one of the main things I wanted to do was bring the reader to the city I know. The type of paranormal I chose also fit well with the setting, as does his profession. Angelo and Dominic are a slow burn type of couple, which is perfect, given the circumstances. But when they come together—oh, so hot! How did you find setting your story in San Diego? Amber: I like the city of San Diego. I’ve visited it a few times and I’ve always had fun there. I’m really looking forward to returning there for the Gay Rom Lit conference. When I’ve gone to San Diego in the past I’ve always been impressed by how vibrant a city it is. Being from Seattle I always enjoy cities by water. Devon: The Unconventional anthologies were literally a dream of mine—I told the other authors about the dream I’d had of being in an anth with them, and we ran with it from there. After the first one, the rest have all been set in the cities where an annual conference we attend is held, and this year is San Diego! The beach community vibe is strong, so setting our stories in a beachside bar was a no-brainer! TA: I loved setting it there. I’ve never visited San Diego and look forward to going there in October. Writing the story helped me get an idea of the city and the surrounding areas, which will help when I’m there. Devon: I started my career with short stories so I feel really comfortable writing them. They’re best when you take a really specific event or point in time to explore, so they can be very action packed. You have to make sure your characterization is on point, and that you start the story with a bang—no time for a long build up! I love to jump right in, so short stories are a lot of fun for me. Amber: I do enjoy writing short stories. Some of my fans think I should write longer and I will be releasing longer stories in the future. I think the challenge of fleshing out an entire story in a few words. Maybe I’m just a person of few words but I have fun trying to capture a person’s story in under 30,000 words. Jambrea: I love writing short stories. To me, it’s an art. An author has to have a nice beginning, middle and end just like a longer story, but with less words, meaning you have to know where to stop and make sure that it is fulfilling to the reader. I like to do that by adding an epilogue. It can wrap things up and leave readers feeling like they have a full story. Are you excited about GRL this year? Jambrea: I am very excited about GRL. I have been to every single GRL and hope to never miss one because it is so much fun. I get to catch up with people I know online. It is a face-to-face with people you talk to all year. These people read and write what you do and you can feel free to talk about what you love with people who love the same thing. And I get to party. Lol I don’t do much of that outside of GRL so it is nice to have a break from the norm. Carol: GRL always excites me. As one of the organizers, I love seeing all the work I’ve put in over the year come to fruition. It not only allows me to meet and talk to the readers, but it’s a chance to have a drink with fellow authors. It truly is heartening when you see people greet friends they haven’t seen in a year. Those moments make all the hard work worth it. Each year I’m completely burned out by the time October rolls around, but all it takes is a few days at the retreat to get me excited for the next year’s gathering. 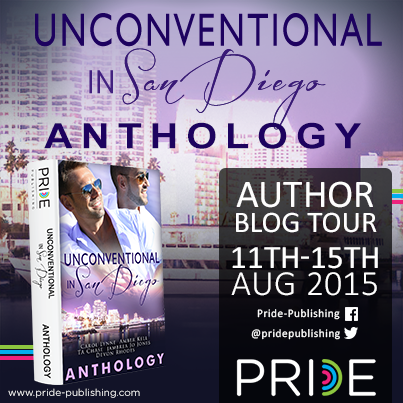 Like the sound of Unconventional in San Diego? Follow their blog tour to find out more!